Ian and Jen met in the Coromandel through mutual friends over New Years Eve a few years ago. A year and a bit after the birth of their first child, the couple saw the opportunity to finally plan their wedding day. “We wanted our wedding to be special but casual, as well as something different” says Jen. 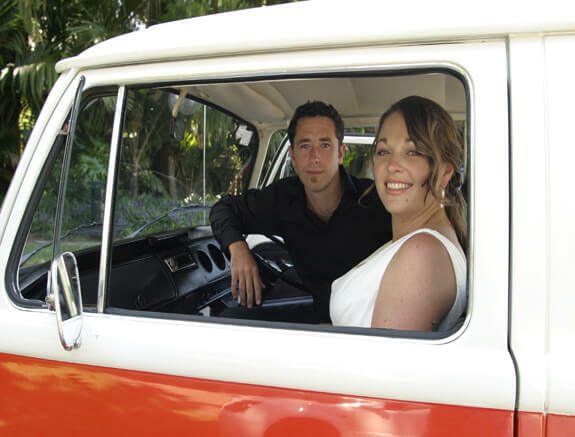 They wanted to create a whole weekend of celebrations surrounded by their friends and family who needed to travel from throughout New Zealand and Australia, where Jen is from. She says “we wanted them to see the beauty of our home town and to see the reasons for living here”. After lots of consideration and visits to venues, they chose to have a family dinner on the Friday night at Okurukuru Winery for the amazing view of the coast and delicious cuisine. Their guests enjoyed drinks on the deck followed by a three course dinner. The next day (6 February 2010), the wedding ceremony was officiated under a big old Copper Birch tree at Brooklands Park. “Because the weather was perfect, the tree gave us the shelter from the sun that we needed as well as the perfect backdrop for our photos” Jen recalls. The bride wore a classic v neck sleeveless layered gown from CC Wards while the girls each wore a dress from Max. The flowers were kept simple for the bridesmaids; each holding a hydrangea tied with ribbons that were purchased from a local hydrangea farm. Jen’s bouquet was custom designed by Rosalie Gibson who went beyond the brides expectations. The guys hired their black shirts and pants from Kingsway Menswear and managed to relax for the morning, slipping in a game of pool at the Grumpy Mole and a few beers before being escorted to Brooklands Park. Jen and her five bridesmaids, including her sister from Australia, got ready at the couples home and arrived at the ceremony in retro style – one red and two orange combie vans! The marriage was officiated in a relaxed atmosphere with friends joining the proceeding with readings and an acoustic performance from a good friend of Jen’s who lives in Australia. The whole moment was special and family orientated, with their son right by their sides. After the ceremony, the bridal party had their photo shoot in and around Pukekura Park by Nathaniel, a family friend, while their guests remained under the copper birch tree enjoying drinks and canapés. They returned to their wedding reception on the Bowl of Brooklands Stage, which had an impressive view from both the spectator side and from the stage. Jen remembers “from the top looking down to the stage, I was totally amazed with what had been created. Our guests were all very impressed as there are not many times in your life that you can experience sitting on such an impressive stage surrounded by a lake”. Ian and Jen hired the draping, tables, chairs, lighting and a fibre optic chandelier which hung from the top of the stage from Theatre Lamp and Lighting. They sourced roses and dahlias from numerous gardens around New Plymouth and the table settings were put together with an array of collected vintage vases. They also had pot plants, planters, a small couch and antique chest for people to relax on. The venue had a contemporary but very vintage theme. “We had help on the day with a wedding coordinator from Something Borrowed who went to every extent to make setting up to my wishes, happen”. The food was catered by Gavin from Delicious Catering with the couple choosing a gourmet BBQ menu. Jen mentions it being well priced with really fresh ingredients and cooked extremely well. “He even provided a special menu for the vegetarians attending the wedding and his staff were all polite, well presented and also managed the bar for us”. With that little bit ‘different’ in mind, the couple’s wedding cake was a family recipe fruit cake as a base with a couple of cheese rounds to make up the layers that they purchased from Whitestone cheese factory. “My Mum put our wedding ‘cake’ together, placing the fruit cake on two pieces of wood and then the cheese rounds on top. We had a couple of figurines made too and she dcorated it to give it a rustic look which was very cool and different”. After cutting the cake and a few thank you speeches, the night rocked on with a DJ who played funk and 70’s groove which was a hit with their guests who couldn’t stop dancing. At midnight the wedding party moved downtown to a local bar for the wedding after party where they enjoyed cocktails and nibbles and treated like VIP guests. To finish off their memorable wedding weekend, Jens parents held a brunch at their house the next morning with a leg ham from Ruby Fields Free Range farm and croissants that they catered themselves. Petit Paris were hired to come along with their mobile coffee machine to make well needed cups of coffee, and everyone enjoyed sitting in the sun reminiscing the wedding weekends events. Photographer: Family Friend. Venue: Brooklands Park and TSB Bowl of Brooklands. Wedding Attire: CC Wards and Max. Kingsway Menswear. Hair and Make-up: Bridesmaids. Flower Bouquets: Rosalie Gibson. Transport: Friends Combie Vans. Music: The General DJ from the Most. Cake: DIY. Catering:Delicious Catering. Hire:Theatre Lamp and Lighting. Something Borrowed.